The polarization of incoming light is modulated electro-optically. For an immobile fluorophore, absorption of light and thus fluorescence only occurs when its transition dipole aligns with the excitation polarization. This results in modulated fluorescence. 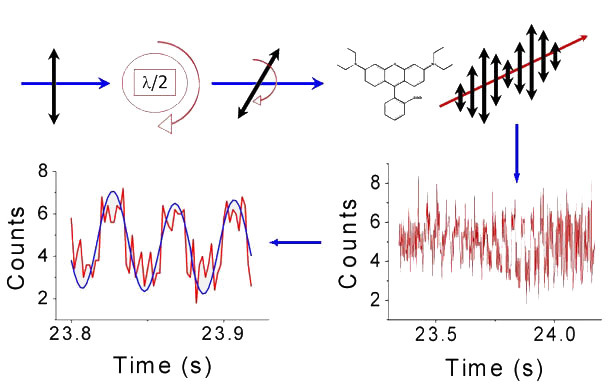 A fluorophore that is reorienting on the time scale of the polarization modulation will show little modulation in its fluorescence, and thus the depth of the modulation can be used as a probe of fluorophore mobility. This technique has been utilized in several experiments involving the binding of CaM to one of its target enzymes, the plasma-membrane calcium ATPase (PMCA). Results suggest heterogeneity in the dynamical structure of the complex of CaM-PMCA complex, an example of the type of information available by single-molecule spectroscopy. The occurrence of occasional periods of low mobility, characterized by high polarization modulation, indicates that the simple picture of CaM bound to a flexible (and therefore orientationally mobile) CaM-binding domain of the PMCA is incomplete, and that an intermediate step exists in the CaM-induced activation of the PMCA (see figure below). Osborn, K. D., Zaidi, A., Mandal, A., Urbauer, R. J. B., Johnson, C. K. 2004. 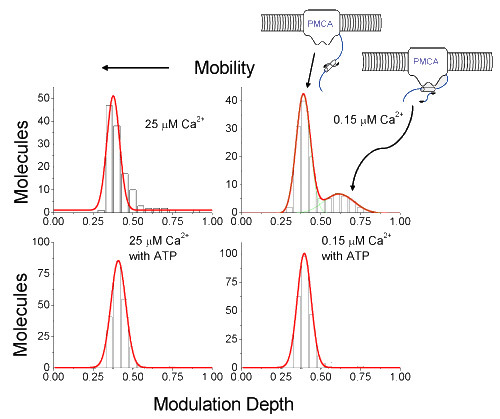 Single-Molecule Dynamics of the Calcium-Dependent Activation of Plasma-Membrane Ca2+-ATPase by Calmodulin. Biophysical Journal. 87:1892-1899. Osborn, K. D., Singh, M. K., Urbauer, R. J. B., Johnson, C. K. 2003. Maximum-likelihood approach to single-molecule polarization modulation analysis. ChemPhysChem. 4:1005-1011.